In the few years after I moved to Los Angeles, I’ll admit that my mornings would be ridiculously unproductive. I would roll out of bed, play with the cats, entertain the idea of going to the gym while jumping in the shower and haphazardly set on my way through the monotony of the work week: Eat, Work, Sleep, Cats, Repeat. Though my weekly charade got me to the weekend in one piece, I can’t say that my mind, body and soul were in harmonic balance. Rudimentary routine escaped me and I most certainly hadn’t even entertained creating any sort of personal ritual. Leave it to my first yoga class in 2012 to set my mind right. What struck me so succinctly was the necessity to practice with intention – not just yoga, but every little facet of life. Ever since, I’ve developed a few small practices, and I encourage you to do the same because when I permeate the present with purpose, I’m not only proud of the work that I do – but I find I get more done and am happier to to it. Whether its a daily, weekly or monthly pursuit – the development of sacred rituals and mantras allows one to hone in on their personal potential while infusing the moment with positive intention. Whether personal and private or social and shared, a ritual has importance beyond the moment and has a heavier grasp on our psyche, playing a vital role in regulating our mental and emotional states. 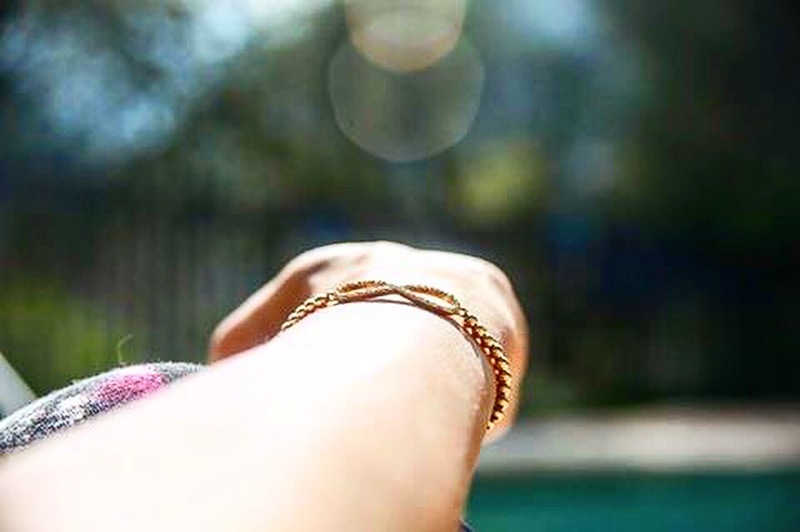 By routinely focusing our internal energy and calming down the external world around us to a whisper, rituals reduce stress, depression and anxiety while simultaneously increasing our self discipline, enhancing our creativity and adding to our general sense of self and well being; by purely focusing on the moment, we allow ourselves to truly be present. Though in a traditional sense ‘ritual’ is related to a religious pursuit, to me – a ritual is a repeated tradition seeped in personal significance. When it comes to the every day, simple rituals like a hot pot of coffee paired with 20 minutes of a good book can set the morning on the right foot; at night, rinse and repeat but replace your beverage with some calming tea. Realistically, rituals can range from skincare regimens and stretching routines to mid day siestas and late night rune readings. A tried and true night owl – I enjoy implementing a morning ritual to set my intentions and ramp up my day; but for you it might be something that helps you wind down and out, allowing you to process your waking moments. Your ritual can be as simple as setting a daily intention, or a morning mantra, or it can be cathartically complex; either way, it should invoke calmness and tranquility throughout the day. Translated from Sanskrit and part of the Hindu and Buddhist practice, a mantra is a phrase, sound or word repeated over and over to increase concentration and awareness; some personal favorites are – ‘I will be fully present in the moment’, ‘seek the good’, ‘the grass is greener where you water it’, and’find comfort in the chaos’. 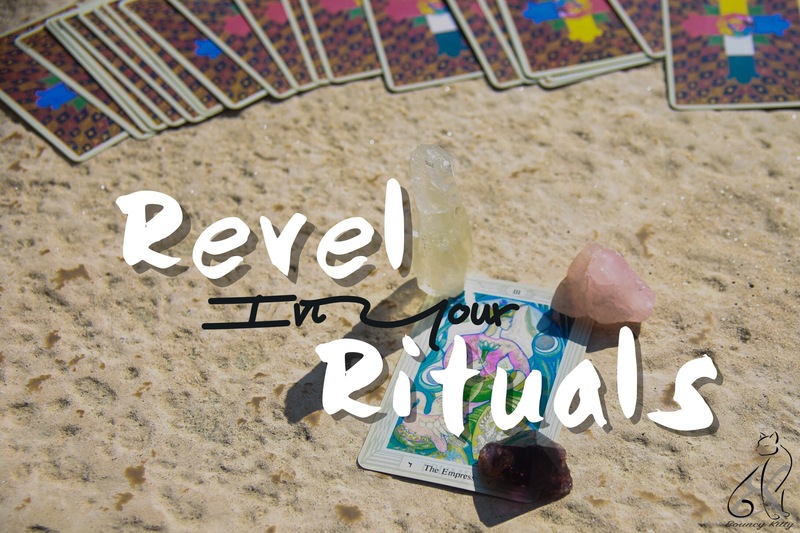 When it comes to rituals, my personal favorites include journaling, reading, music, meditation, road trips, arranging and cleaning crystals, playing with my cats and dancing. To you they might sound like hobbies, but for me there’s something simple yet sacred about all of those pursuits and combined, my heart truly sings when engaged in those activities. For those that enjoy being more physical like myself active pursuits like yoga, a trip to the gym or an enjoyably long walk with your dog, a friend or significant other will set off the day or night in a positive light. On a larger scope, weekly rituals like a set gym or yoga schedule and standing date night with your significant other or social circle give you something to look forward to on a weekly basis and strengthen your support system at the same time. I’ve also taken fondly to monthly rituals like writing out my monthly intentions, engaging in full moon tarot readings and adventuring to a new nature infused landscape. Lastly but certainly not least, avoid becoming stuck in a rut with your rituals – remember -they should let you breathe new life into your day, not bog you down with unneeded responsibility. What are your favorite ways to break in the days, weeks and month? Do you have any rituals that you hold dear to your heart?